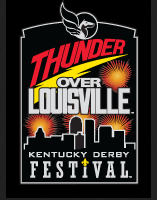 Thunder Over Louisville, the annual kickoff event of the Kentucky Derby Festival, is an airshow and fireworks display held in mid April in Louisville, Kentucky. It is the largest annual fireworks display in North America and has been held since 1990. Thunder lasts throughout the day, and the fireworks display last for around half an hour, along with a synchronized soundtrack through PA and radio. An average of 625,000 people have attended each year since 1997, lining the banks of the Ohio River in Louisville, and across the river in Jeffersonville and Clarksville, Indiana. Some also watch from the river on boats, docked in positions auctioned off for charity. Eight 400-foot barges launch the fireworks, provided by Zambelli Fireworks Internationale, from both sides of the George Rogers Clark Memorial Bridge (Second Street Bridge), and more fireworks are launched from the bridge itself. 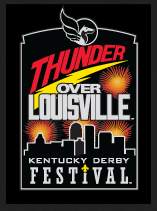 The estimated attendance at Thunder is usually (first decade, 21st Century) approximately five times that of the main attraction, the Kentucky Derby horse race at Churchill Downs.